Has Cloud Computing Grown Up Yet? Has cloud computing grown up yet? The answer is a resounding yes, based on a recent Luth Research survey*. Well, in the U.S., anyhow. The survey results, called Cloud Succeeds. Now What?, compiled by Luth Research and Vanson Bourne, and posted by CloudTweaks reveals that the U.S. cloud computing market is relatively mature. Has cloud computing grown up? Yes, and concentrating more on the speed to innovation aspect of the cloud rather than cost savings, which is the focus of the younger European market. In fact, cost reduction did not even make the list of the top three objectives in the US. And the big news: Ninety eight percent of respondents report that not only has cloud computing grown up, its EXCEEDING EXPECTATIONS in delivering on its promise of saving money and speeding time-to-market. 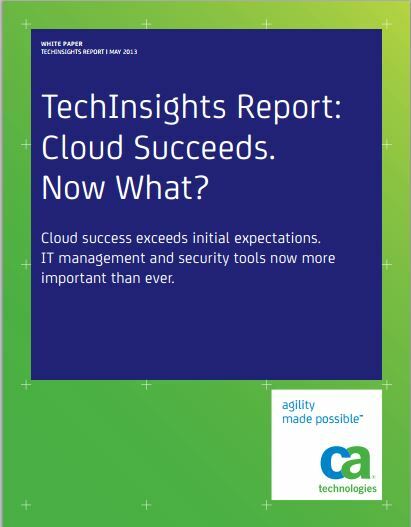 Survey participants—IT professionals in management who have utilized cloud services for a minimum of a year—report they are receiving improved results, quicker deployments and reduced costs than expected as a result of cloud computing initiatives. In fact, companies that have been benefitting from the cloud for at least four years are almost six times more likely to report that they are increasing cloud spending by more than 30% in 2013. When we discuss cloud computing, we frequently talk of its relative infancy. We note the incomplete standards, the lack of understanding, the limited adoption as examples of how young cloud computing is in within the technology ecosphere. While the cloud might still be relatively new when compared to its much-older techno-peers, a recent survey sponsored by CA Technologies reveals that the cloud has moved beyond its infancy. Businesses spending more on cloud computing. Businesses that have benefitted from the cloud for a minimum of 4 years are nearly 600% more likely (34% compared to 6%) to increase their cloud spending by more than 30% in 2013. Also, American companies lead their Euro counterparts in projected cloud spending by an important margin.